Looking at a map of Canada, Vancouver Island isn’t much more than a dot off the coast of British Columbia. But this is Canadian scale – where everything is bigger than it looks. In reality it’s the largest Pacific Island east of New Zealand, stretching 290 miles from north to south. After exploring the city of Victoria, our next stop was the Great Bear Rainforest, reached via Port Hardy at the north of the island. Now in this part of the world you can get almost anywhere by air – seaplanes mean you don’t need an airport or even a runway. But if you flew over you’d be missing out on seeing the island itself. 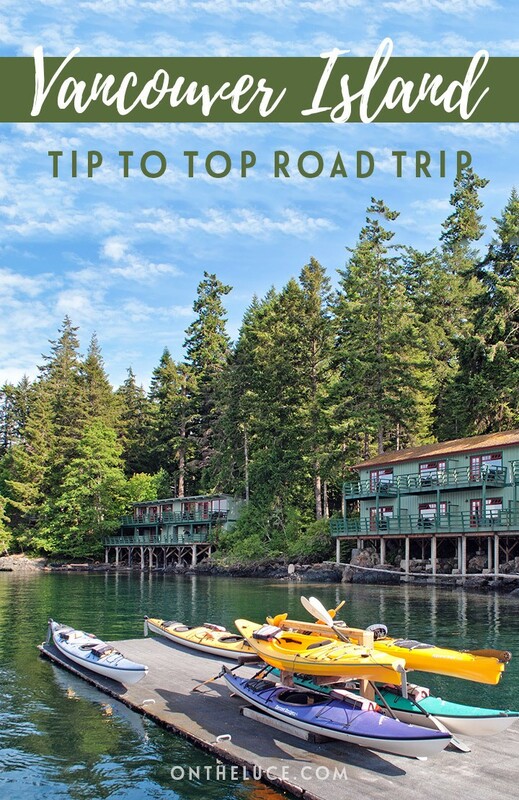 I’d read about its mix of arty small towns and wild landscapes, from mountains and lakes to beaches and rainforests, so was looking forward to getting out there among it all on a Vancouver Island road trip, taking us from the tip to the top. After leaving Victoria, we followed the coastline as it wound north, catching glimpses out across the water from up on high. Our first stop was at Blue Grouse Winery for a tasting session. All good trips should involve wine-tasting as far as I’m concerned, so I was excited to learn more about Canadian wine. It isn’t the first country you’d think of for wine (unless it’s the ice variety), but this part of the island has a growing number of wineries. Up here you’re at the far reaches for grape-growing, but as well as Vancouver Island having Canada’s mildest climate, the Cowichan Valley is 10 degrees warmer than Victoria – it gets its name from a First Nation’s word meaning ‘warm land’. Pick the right soil and a south-facing slope and grapes will thrive. Most producers here are small-scale, making only a few thousand cases of wine per year. 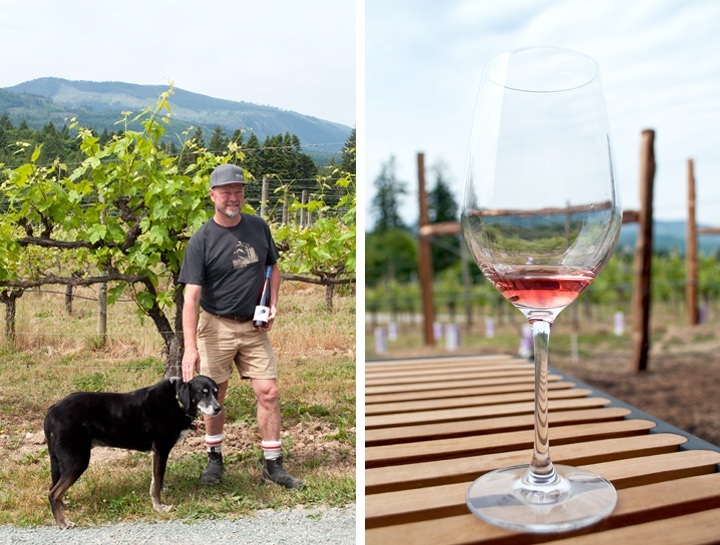 Blue Grouse was one of the first Cowichan wineries, growing grapes here since the 1970s and setting up their tasting room in 1990. 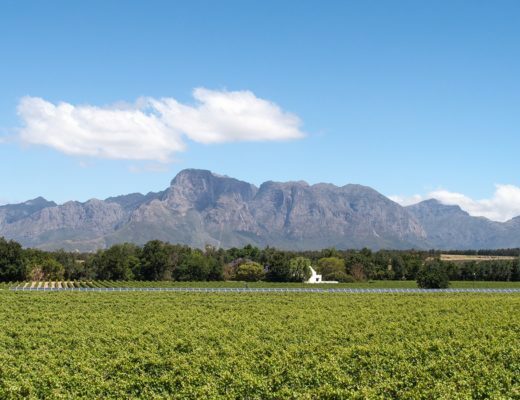 It’s recently been redeveloped into a new, bright and airy building with views out over their vineyards, where winemaker Bailey Williamson took us through a tasting of some of their wines. The climate here is best for white grapes, though we did try an unusual black muscat, a cult favourite red which has flavours of lychee. Most of the white varieties are cross-bred grapes designed for cooler climates. So you don’t get the big names like Chardonnay and Sauvignon Blanc, but instead there are varieties like Bacchus and Ortega. It’s very similar to what you’d see growing in the UK, and in fact the owners of one of the top UK vineyards – Nyetimber – come from this part of the world. Back on the road we carried on along the coast past the city of Nanaimo. Just across the other side of the Salish Sea here is Vancouver – our destination later that week. Nanaimo is intriguingly called the ‘Bathtub Racing Capital of the World’ after an annual race over to Vancouver, where competitors use baths converted into boats. One to check out if you’re in the area on the last weekend in July! But we headed on northwards for lunch at another quirky stop – Coombs Country Market. 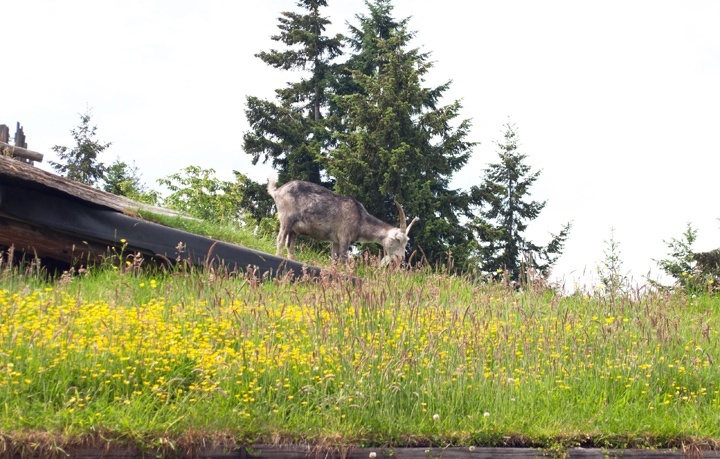 Not just your average shop and restaurant, it’s famous for its grass-covered roof that’s home to four resident goats. They’ve got a wooden house to live in and plenty of grass to munch on, which they do oblivious to the camera-toting tourists down below. We had a (goat-free) Italian feast of pizza and pasta at in Coombs’ Cuckoo restaurant before heading on. As we travelled further north up the island, we passed waterside holiday spots to one side and the ski resort of Mount Washington on the other. Our destination for the night was Campbell River, where we were visiting two twin resorts that face each other across the water. 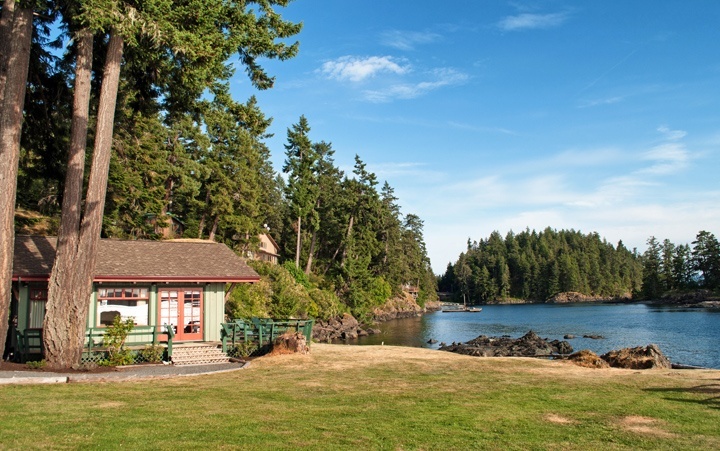 On the Vancouver Island side was Painter’s Lodge, famous for its salmon fishing. 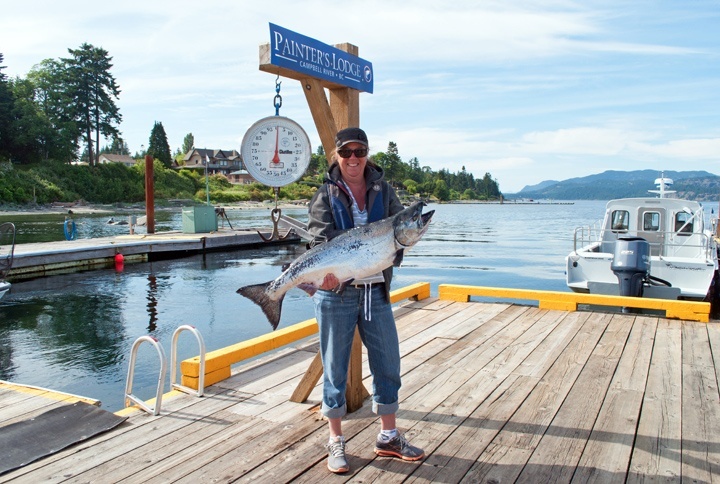 I had no idea how big salmon could get (mine come filleted from the supermarket) but here they have a special club for people who have caught one bigger than 30lb, known as a tyee. And if catching one that big isn’t hard enough, you need to do it from a traditional rowboat too. While I was waiting down at the harbour a group sailed in with a woman brandishing a huge salmon. It was so heavy she could hardly hold it up for the photos, but even this didn’t quite make it to 30lb. 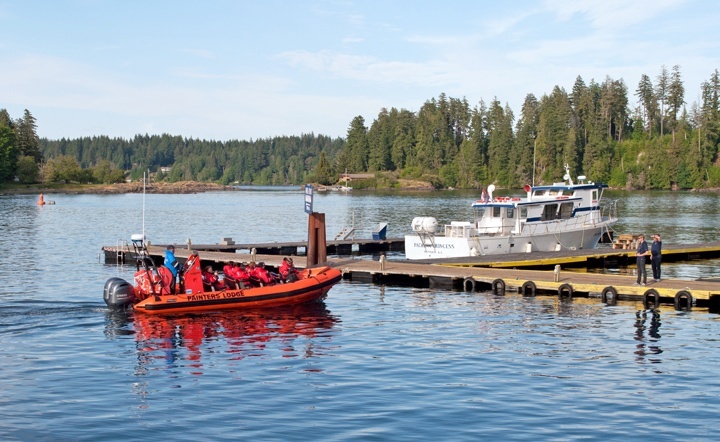 A five-minute boat ride across took us to April Point Resort on Quadra Island, one of the enticingly named Discovery Islands. 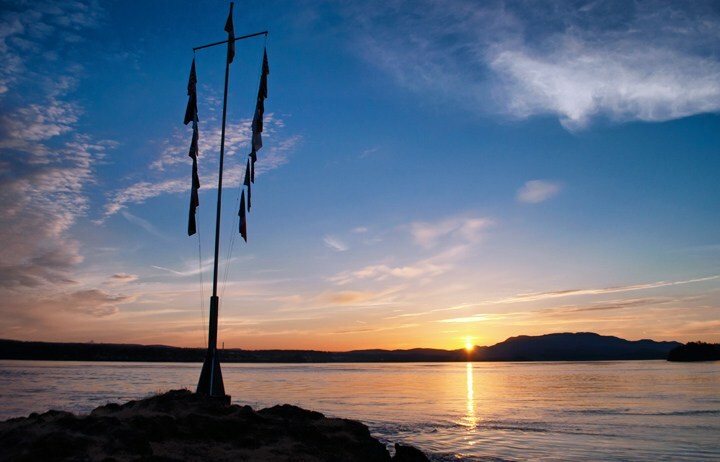 It gets its name from Peruvian explorer Juan Francisco de la Bodega y Quadra who mapped the BC coastline along with another famous name, George Vancouver. 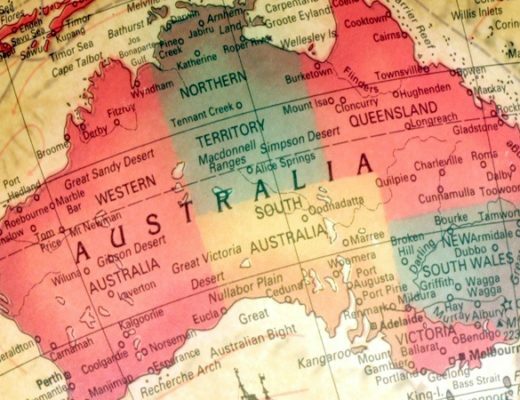 The island is 22 miles long and a permanent home to 2700 people, including First Nations communities, mostly living in the south and leaving the north as unspoilt rainforest. You can hike, cycle, kayak or take a Zodiac boat tour to spot wildlife. But I’d have happily spent a week there just soaking up the scenery. Wooden cabins look out onto the water from among the forest, reminding me of one of my favourite-ever spots. It’s one of those places where you feel miles from modern life and your stresses just drain away. We had dinner (featuring salmon of course) on the island and watched the sun set over Campbell River before I had to drag myself away. The next morning we said goodbye to half of our group who were heading to Knight Inlet, while we got back on the road for our final stretch up to Port Hardy, Vancouver Island’s most northernmost city. The road left the coast behind and headed inland, but we didn’t get far out of Campbell River before our first stop at Elk Falls. Surrounded by thick conifer forest, the falls drop 25 metres down into a rock-walled canyon. 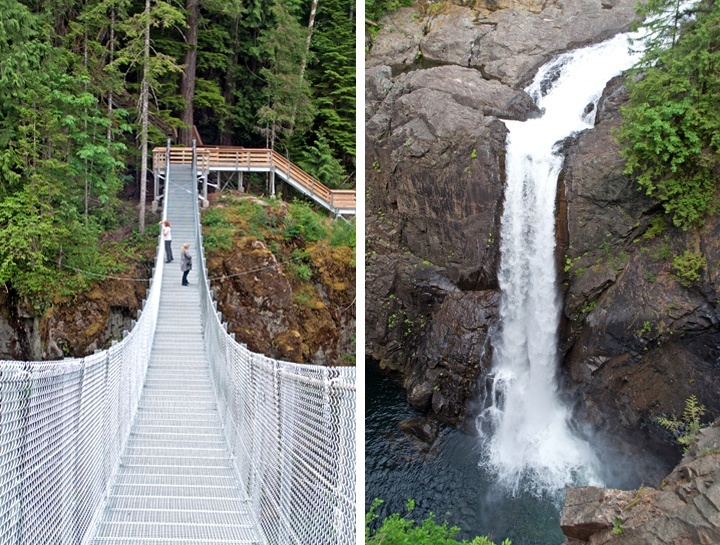 We followed the pathways through the trees to the new viewing platforms and a 60-metre-long suspension bridge which has been built across the canyon, giving you great views of the falls. Leaving Campbell River behind the road got quieter and the towns got smaller and sparser. After miles of forest roads we emerged back out on the coast near our final stop at Telegraph Cove. 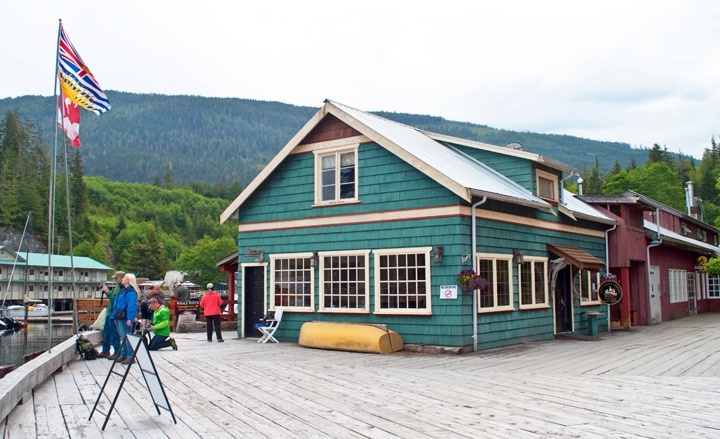 The village started off as a fishing port with a population of one and developed into a sawmill and cannery. Now it’s an eco-tourism hub and prime whale-watching spot, with a tiny whale museum. Although it’s packed in summer, off-season there are only 20 permanent residents and the lovely, bright-coloured fisherman’s houses along the shore have been turned into holiday rentals, where you can go off the grid for a few days away from phones or TVs. But we had to leave it behind and carry on for another 40 miles to Port Hardy, where our road trip had to come to an end at the seaplane harbour – because beyond here there was only water. I visited British Columbia as a guest of Destination Canada as part of a Travelator Media campaign. This article contains affiliate links, where I get a small commission at no extra cost to you – thanks. 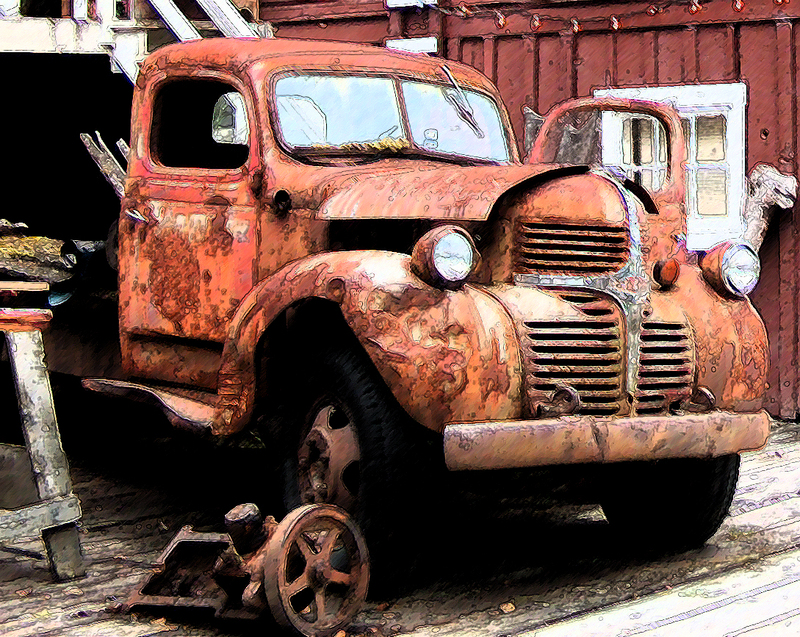 I have been to pretty much all those places Lucy, and even have the photo of the rusty car! I was waiting for you to mention the Nanaimo bar – a confectionery that I didn’t try either. How funny, love the vintage effect on the car photo too. Can’t believe I didn’t have a Nanaimo bar either, will have to try and recreate it back home! It was a fantastic trip. You’re post brought back many happy memories. Would dearly love to go back one day. Me too Kathryn, it’s been fun reliving it all while I was writing it up though. Thanks Darlene, we did see some lovely places – and the goats were great! Thanks for the book recommendation too, it looks really good. Great to hear and see your full adventure along the island – and what we missed by leaving you part way!!! Good excuse for a return trip though to see what you missed! 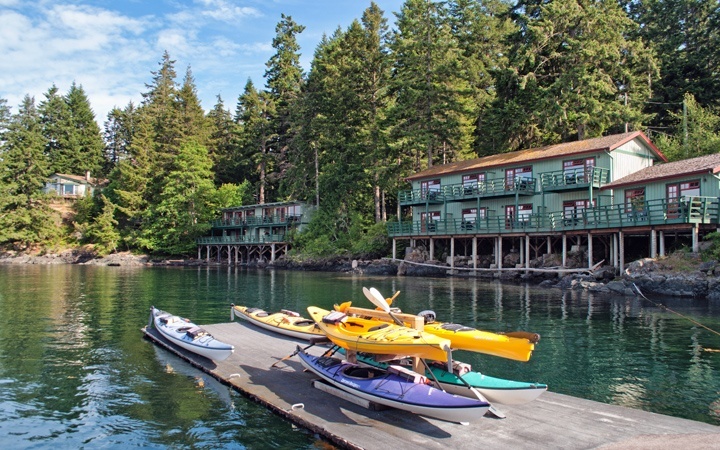 We didn’t have chance to get to Tofino but it looks lovely – one for the next visit, love the idea of the hot springs! There’s definitely a lot to see – we didn’t even get near the west coast! – and such diverse landscapes, it’s a lovely island. The scenery was just beautiful – and the salmon was really tasty too! Great to relive this trip and see what we missed when we left you. Loved the quirky goats on the roof! It’s a good excuse to head back to see the top part of the island! I’ve been thinking about visiting in 2016 and ever since then I keep seeing blog posts about it. It’s clearly a sign! Thanks for the tips. Funny how that happens isn’t it! Loved Canada (and can’t wait to get back and see more) so hope you get to make the trip out there soon.